It's just the start of the year, but things are about to get really exciting on Monday 28 January, 2013! 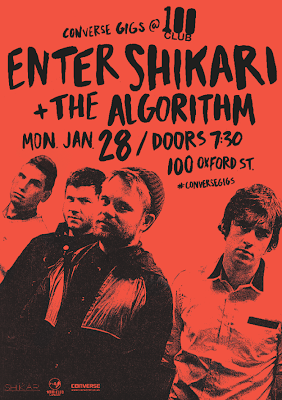 Converse Gigs @ 100 Club announce Enter Shikari for their January Show! This will be Enter Shikari's first headlining show for the new year - 2013! 2012 was a GREAT year for Converse Gigs as they had countless back to back shows with the likes of Nas, Santigold, Toddla T, Plan B, Everything Everything and more big acts to name a few to take the stage at the 100 club. 2013 marks the 10 years of Enter Shikari since they formed in school in Hertfordshire back in 2003, Enter Shikari has played over 1,000 live shows selling numerous prestigious venues worldwide. And now, the band will end their European headline tour by taking to the 100 Club’s legendary stage for a money can’t buy, up close and personal performance. Enter Shikari will not be gracing the stage alone at the 100 Club though, as support on the night comes from - The Algorithm, brain child of talented producer - Rémi Gallego. This is clearly going to be a GREAT night!! Last year was a successful year for The Algorithm. After a successful premier of their live show at last year’s Euroblast festival, The Algorithm have gone on to destroy venue and festival stages across the globe, perfecting their trademark sound along the way. Infusing modern metal breakdowns with a menagerie of electronic subgenres, this live experience promises to be unlike anything the metal or electronic worlds have experienced before. After a successful premier of their live show at last year’s Euroblast festival, The Algorithm have gone on to destroy venue and festival stages across the globe, perfecting their trademark sound along the way. Tickets are FREE and will be available exclusively via the Converse UK website www.converse.co.uk/conversegigs from THURSDAY 10th JANUARY 2013. SHOW IS 18+ AND ID WILL BE CHECKED!